Kalinga Sun Dried Rice for sale. Buy online at Zingerman's Mail Order. Gourmet Gifts. Food Gifts. Red heirloom rice from the terraced fields of the Philippines. Kalinga Unoy is a rusty-red, speckled colored rice grown with organic methods on ancient terraces in the Philippines, then naturally sun dried for three days. 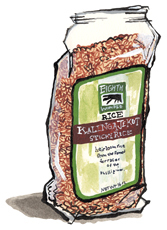 Cook Kalinga like you would other rice. A delicate, sweet, nutty aroma lifts off it when it’s cooking and follows right through to the flavor of the finished dish. Great as a side or even as a focus of the meal. Its aroma and flavor will get you excited, I guarantee. Due to typhoon damage in the terraces in Kalinga Province in 2016, the Kalinga Unoy rice is not currently available. We're not certain when it will return, but hoping that the rebuilding is going well!